This lift truck series features a 2-wheel drive system and solid pneumatic tires for added traction in wet or moderate outdoor environments. The 3-wheel design gives the forklift excellent maneuverability in crowded dock areas. This forklift is well suited for indoor/outdoor use in manufacturing, warehousing and distribution, and shipping and receiving applications. Each lift truck comes with programmable safety and performance features to fit your exact needs. This system compares to similar internal combustion lift trucks in acceleration rates, speed and its ability to climb inclines. Programmable to meet specific needs – choose from four pre-set performance modes. 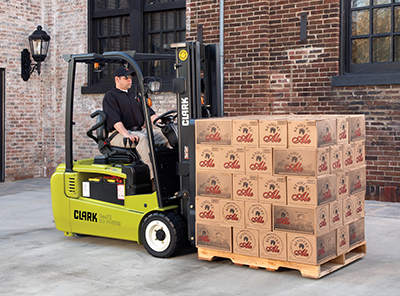 Alarm codes provide a safer lift truck. Some adjusts can be password protected to prevent unauthorized users from changing the setting. The system is brushless and enclosed, has temperature and stall protection, has a dual powered reversing system that makes tighter turns and it’s suitable in watery environments. The same motors are used for E and EE machines. These models have 2-wheel drive that provides added traction, especially in undesirable environments. The inside wheel prevents scuffs or abrasions during tight turns. Hall Effect Steer Sensor allows better maneuverability of the steer tire. This model has a slightly wider turn radius than the TMX series models. Nested I-Channels keep cylinders, hoses and chains that provides the best visibility while the hydraulic cushioning valve keeps shock and vibration down. The 6 rollers disperse the load evenly and decrease free play. Wet Disc Brakes have enclosed and oil cooled processes that are fluid and muffled. They’re built with a lining material meant for longevity in production. The hinged rear control allows for easy service access so the lift truck isn’t out of commission for a long time. The on-board diagnostics make finding the problem easy for the mechanic. For pricing and leasing information, contact a Forklifts of Toledo Sales Representative.